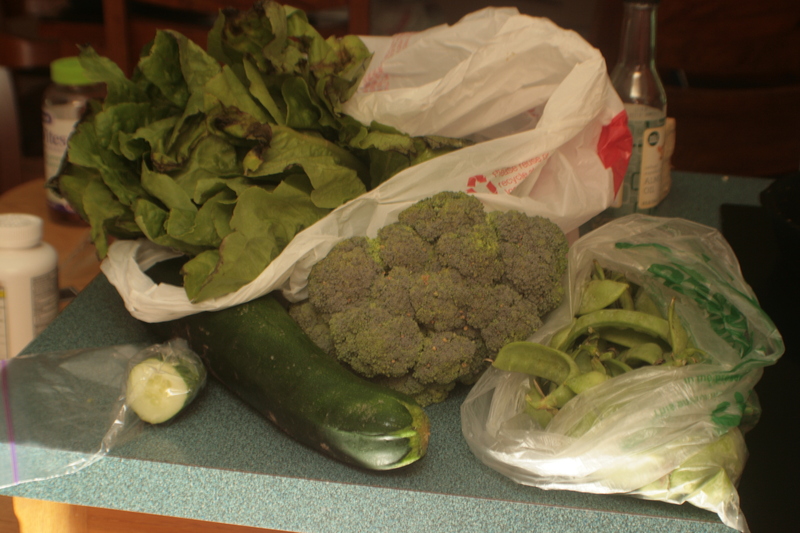 We’re a month into the CSA adventure and I gotta say, I’m starting to feel overwhelmed by vegetables. Yesterday was Wednesday, i.e. delivery day, and this is not even everything we still had in the fridge from the week before. We really need to be cooking big dinners every night to get through this, and it’s just not happening. And I’ve gotten busy enough that I’m heating a good half of my meals in the car on the way to somewhere, which makes cooking hard. But yesterday I had a gap in the middle of the day and decided that I was going to make myself a nice lunch. I don’t think I’ve ever expressed my love for our mandolin here before. Let me do that now. I LOVE OUR MANDOLIN. It cuts things so much better than I can, and faster, too. 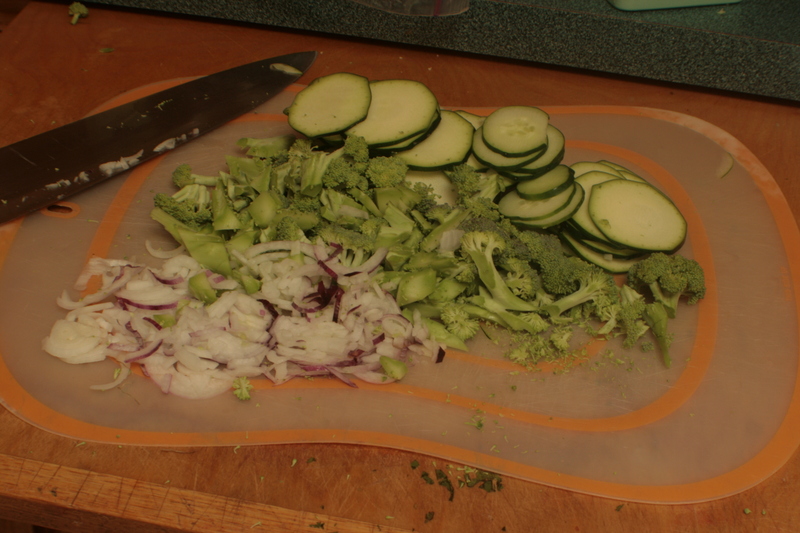 Well, technically I’m cutting them with the mandolin, but it does it better than I do with a knife. And when I’m trying to cram time to actually cook lunch into the middle of a fairly packed day, that’s nice. I was envisioning this meal as a deconstructed lettuce wrap stir fry thing. Honestly, there wasn’t a very clear plan other than “it might be nice to plate it with some of this OMG TONS OF LETTUCE at the bottom.” It’s possible that I’m tired of having salad for lunch and acting out with strange plating techniques. 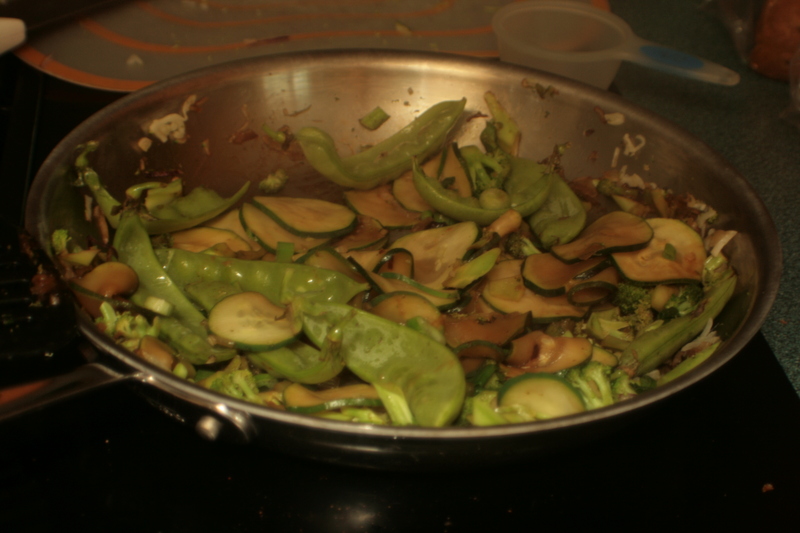 This part is really just stir fry. I threw in some soy sauce and some fish oil, then got tired of trying to plan the meal while compulsively checking my email (negotiating counter offers turns me into an obsessive phone monster) and decided that if Thai Peanut dipping sauce/marinade was good enough for the glass bottle, it was good enough for my stir fry lunch. 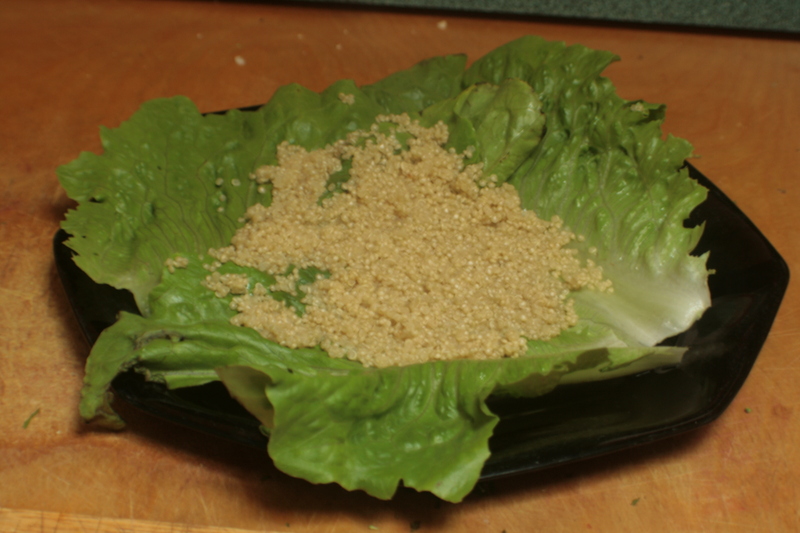 I’m playing with quinoa. This marked the second time I’ve cooked it. It’s actually pretty easy to get decent flavor from and the texture is nice. Plus it has some protein in it, which saves me from needing to throw in eggs or cheese or something to flesh out the nutritional content. And that was the final product. It was tasty, and it kept my sated until dinner time. I wouldn’t call it a success, though. 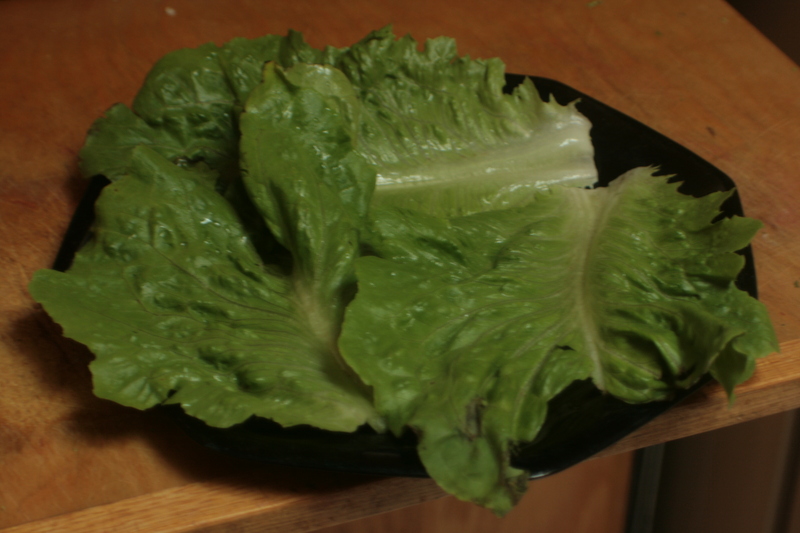 I should have just gone ahead and made it lettuce wraps (which would have made it harder to eat while working, but oh well) because as it was, I wound up with giant leaves of lettuce on my plate staring up at me and saying, “How did you think we were getting eaten, again?” The bottled Thai marinade did its job on the flavor front, but I spent most of the time longing for mushrooms in the stir fry. 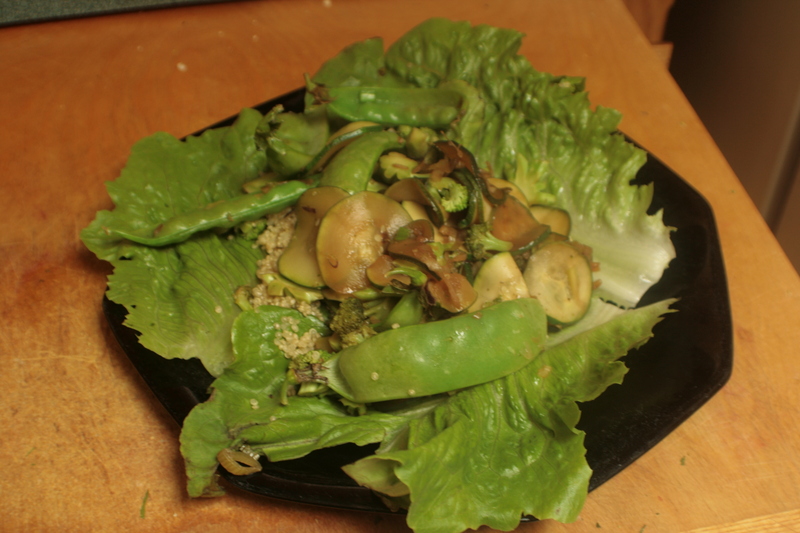 The snap peas were critical to the dish working at all, though – their firmer texture were about all the sass this had. Not one of my finer showings. But hey, nobody but me had to suffer through it, and you got pretty pictures, so we can still call it a win. Also, wow is the lighting in the kitchen massively different in the middle of the day than it is when I’m usually taking pictures in there. Especially with giant clouds taunting me with maybe-rain going by overhead.